Please note that the content of this book primarily consists of articles available from Wikipedia or other free sources online. 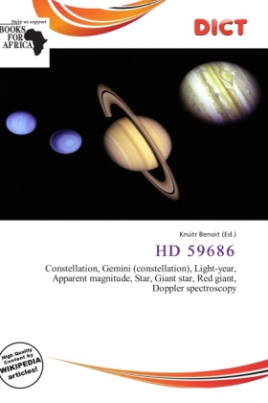 HD 59686 is a 5th magnitude star approximately 316 light years away in the constellation Gemini. It is an orange giant meaning it has ceased fusing hydrogen in its core and on its way to becoming a red giant. The stellar radius is very large. In November 2003, the planet was announced orbiting the giant star by Mitchell which he used Doppler spectrometer to look for effects on the star caused by the gravitational tug of the orbiting planet. Using the amplitude from the radial velocity method, he calculated the planetary mass as 5.25 Jupiter masses and with period 303 days.